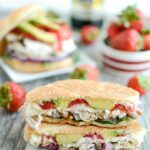 This Balsamic Chicken & Strawberry Panini strikes the perfect balance of flavors for a quick and easy summer lunch! A great way to transform leftover chicken into a new meal! Form the sandwich by layering spinach, if using, chicken drizzled with balsamic, strawberries, mozzarella and avocado. Form a sandwich and place on panini press or grill pan and cook until the outsides are golden brown and the cheese is melted.